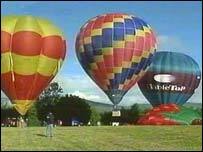 Frustration has turned to joy for hot air balloon enthusiasts in County Londonderry, even if it meant rising very early in the morning. 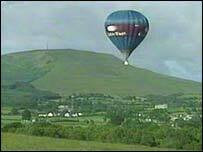 The sixth annual Sperrins Balloon Festival has been taking place in Draperstown all week. Weather conditions had made things difficult for the balloonists who had travelled from across Europe to take part. Just six balloons flew in the first festival, but this year, 22 owners brought their aircraft along in the hope of getting up in the air for some spectacular birds-eye-views of the Sperrin mountains. The balloons did get a chance to fly on Tuesday, but unpredictable conditions left them grounded for the rest of the week-long festival. A window of opportunity finally opened early on Friday morning, at about 0500 BST. The long wait for perfect conditions was over, but it meant all but the very early risers like local farmers got a chance to see the balloons in flight. Festival organiser Peter Hegarty said he felt it was lucky that they managed to get airborne twice in the week. "I think it's going to change soon," he said. "We got two slots in - 15 flew on Tuesday morning and 14 flew this morning." "The sky over Draperstown was awash with colour"